God provides deliverance from sin and spiritual death to all who believe and accept His free offer of forgiveness. Mankind's only hope of redemption is through the blood of Jesus Christ, God's Son — blood that was shed when Jesus died on the cross. All believers are entitled to receive the baptism in the Holy Spirit. It is accompanied by the initial physical sign of speaking in other tongues (unlearned languages) as the Spirit of God gives audible expression. This was the normal experience of all believers in the early Christian church. With the experience comes the provision of power for victorious Christian living and productive service. It also provides believers with specific spiritual gifts for more effective ministry. All Christians who have died will one day rise from their graves and will meet the Lord in the air. Christians who have not yet died will be "raptured," or caught up with them, to be with the Lord. Then Christians of all ages will live with God forever. The scriptural truth of the Lord's soon return is "the blessed hope." 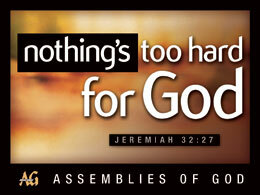 For scriptural references and more information about our beliefs, visit the Assemblies of God website using the links below.